We visit the Corinth Canal, The Epidaurus, (the archaeological sit and the famous Theater), the picturesque Nauplion, (short stop over) and Mycenae, (archaeological site). 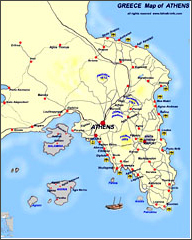 Through Megalopolis and Tripolis we arrive to Olympia for dinner and overnight. After the morning visit of the site and the Museum, we drive via Patras, the Rio - Antirion channel and Nafpaktos to Delphi for dinner and overnight. In the morning we visit the site and the Museum and we return to Athens.